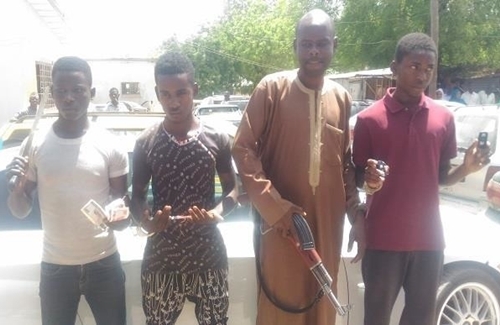 A dismissed sergeant of the Nigeria Police Force attached to Jigawa state police command, Sani Danjuma (holding a gun), has been arrested for leading a robbery squad to attack a guest house in Kano metropolis belonging to the deputy governor of Jigawa state, Barr Ibrahim Hassan Hadejia. "An information through a good samaritan was disclosed to the Special Anti Robbery Squad (SARS) in Kano that armed robbers with dangerous weapons attacked the guest house of the deputy governor of jigawa state located along Okashatu close off Hadejia road where they attacked the policemen on guard duty and confiscated one AK47 rifle with the rifle No: 26594 loaded with 30 rounds of live ammunition," he said. Majia said upon the receipt of the information, the state Police Commissioner, Rabi’u Yusuf immediately ordered the Anti-Robbery Squad to swing into action, which led to the eventual arrest of the suspects. The arrested suspects have all confessed to the crime.